With all the options out there, people have more to consider when it comes to golf equipment than ever before. Brand, size, shape, adjustability, forgiveness. There are lots of options out there, and endless things to think about but one component that is often overlooked is a golf club’s lie angle. The lie angle is a big factor in determining how your shots travel, and since even an otherwise well-struck shot can go awry if the lie angle isn’t optimized to your swing, it is important to make sure you have the right specifications. Read on for a comprehensive guide on the importance of lie angle. What is a golf club’s lie angle? Simply put the lie of a club is the angle between the shaft of the club, and the sole. Your ideal lie angle will be determined by your height and set-up. When you buy a set of clubs off the rack, they are set with a shaft, loft, and lie angle that is ideal for a player of average height, and average swing statistics. They are made with a golfer in mind, but unfortunately that golfer almost definitely is not you. While it is technically feasible that a club bought straight off the rack may have an optimal lie angle, you are definitely going to want to know for sure. Why is it worth the extra effort? Consistency. If the lie on the club is too upright, well struck shots may still find themselves hooking. If it is too flat, you may find that you have a tendency to slice the ball. Will it happen every time? Of course not, but it also won’t allow you to reach your full potential as a player. Have you ever noticed that when you have an uphill lie, the ball tends to hook? It’s because of the hill changes the lie angle on your club. You can swing the club perfectly fine and still experience shots lost to the left. While the results won’t be quite that severe, you still lose out on accuracy if the lie on your irons and wedges is not correct. Lie is also a factor for putters. The range for a typical putter lie is fairly limited, with most falling in the 70 – 72 degree range, but while there isn’t much by way of variation, it is still just as important to make sure that the specifications fit your set up. The same way an ill-fitted iron can result in more slices or hooks, a poorly fit putter can result in more pushes and pulls. Lie is also a factor in woods but to a much smaller extent. Now that you understand the importance of making sure the lie angle of your clubs complements your set up, you’re probably wondering what can be done to ensure that your sticks are optimized to your needs. Fortunately, there are several options. If you are currently in the market for a new set of irons, this is the perfect time to make sure your lie angle is ideal. While you can have your current set adjusted to your specifications, it is much easier and cheaper to do so with a new set. Determining your lie angle is part of the club fitting experience that you will hopefully opt for next time you buy new clubs. Many people decide against it either because they are unsure they are good enough to see the benefits, or because of the common misconception that it costs lots of money. The truth about club fitting (and by extension, getting a customized lie angle) is that while it can cost a lot of money depending on where you go, there are also many professionals willing to do it for free if you then agree to buy your new clubs from them. While you are getting fit for your new clubs, they will look at your set up, and take measurements to determine which lie angle is best for you. When they order your set to those specifications, your ideal lie angle will usually be provided free of charge. On the other hand if you decide that you want to adjust your current set, you will probably have to shell out a little bit of money. Having them done professionally will require that you book a session with a professional to help determine your lie angle and then adjust your clubs accordingly. Having the clubs bent can actually be relatively affordable: between $3 – 8 per iron, though depending on where you go you may also have to pay the professional for their time. If you decide that you would like to get your old set of irons completely fitted (lie, loft, shaft length), you should expect to pay up to $40 per club, though again prices will vary depending on where you go. Some manufacturers will also tend to your clubs, usually for a reduced rate, though you will then, of course, need to pay shipping and handling, and you can expect to be without your clubs for a few weeks. If you’re reading this and wondering if it is really worth the fifty or so dollars it will cost to get your clubs adjusted, the answer is probably yes. 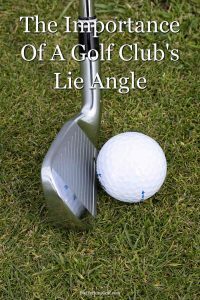 After all, if you care about your golf game enough to read an article about club lie angles, you most likely have been bitten by the golf bug. When it comes to golf, there are no magic fixes. Having your clubs adjusted to your personal specs aren’t going to turn you into Dustin Johnson. You should never count on your equipment to improve your game. What can good equipment do? It can help you get the most out of what your swing is already capable of. If the lie angle of your club is currently promoting hooks or slices, you aren’t giving yourself much of an opportunity to succeed. Golf is hard enough without your clubs working against you, and in this case, the answer is simple. Get fit today for lower scores tomorrow.